No one could have possibly imagined what awaited these men in the coming conflict: deafening noise of artillery, horrific sounds of mayhem, injury, death and destruction. No one could have guessed at the heavy casualties – the injured and the dead. Beyond imagination was the fate of the reliable SS Princess Sophia. Within weeks of the long-awaited armistice, the ship would founder on Vanderbilt Reef near Juneau on October 24, 1918. There it remained stranded for about 36 hours in a roaring wind and snow storm, deemed by the Captain too fierce to risk evacuation of passengers and crew. All perished in the worst maritime disaster in British Columbia and Alaska history with loss of 343 men, women and children, despite having been surrounded by rescue vessels. 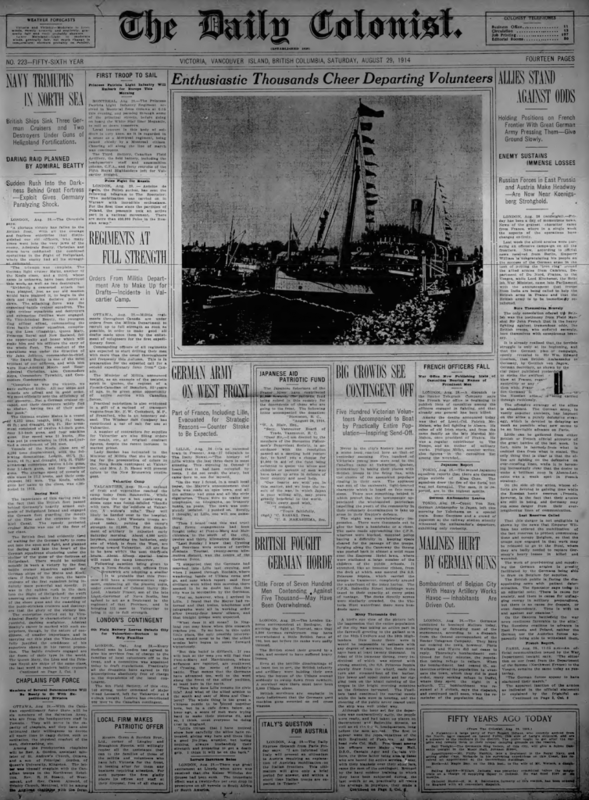 Front page, Daily Colonist, August 29, 1914. The feature article evokes the sounds and scenes of farewell. That day, the entire front page was devoted to war news. Never in the city’s history has such a scene been matched here as that of yesterday morning. Five hundred of Victoria’s young men were sent to the Canadian camp at Valcartier Quebec preparatory to taking their places with British troops in the firing line, with the cheers of the assembled populace ringing I their ears. The applause was not of the exuberant light-hearted character heard on fete occasions. There was something behind it which proved that the townspeople appreciated the wholehearted patriotism impelling the youth of the community in their voluntary determination to take up arms in their Empire’s defense. The sight was overwhelmingly impressive. There were thousands out to give the boys a handshake or a cheer. The main roads approaching the C.P.R. wharves were blocked , mounted police having difficulty in keeping space cleared for the passage of the troops. Surging along the Causeway the throng was pushed back in almost a solid mass over the Empress Hotel lawn where were stationed a large number of school children of the public schools. 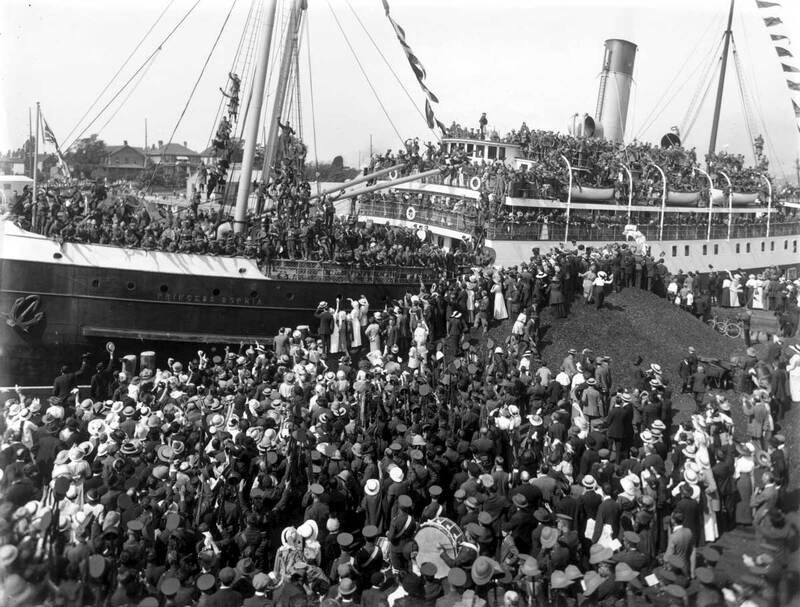 It stretched like an immense ribbon from the dock at which was moored the S.S Sophia, which carried the troops to Vancouver, completely around the inner harbor. The C.P.R. Belleville Street buildings were taxed to their capacity at every point of vantage. The docks directly across were similarly crowded. On the Victoria West waterfront there were hundreds more…. Curator of Images and Paintings, Don Bourdon is researching BC photographers and photographs of the wet-plate collodion era, a period that coincides with BC’s colonial era and waves of gold rush activity.